“Millionairium team delivered what they promised us without charging us up-front,” says Nazy Curtis for Newport Hair Loss Center. Nazy contacted us to help her business grow by improving her site’s results on Google search. Their site was already doing well on Google with a 58.48% visibility for her 90 keywords we had selected. We signed her up with our pay-per-performance program as we believed we could further improve her results. We also set up her phone calls to be tracked to see where each call comes from as she was also running an Adwords campaign. 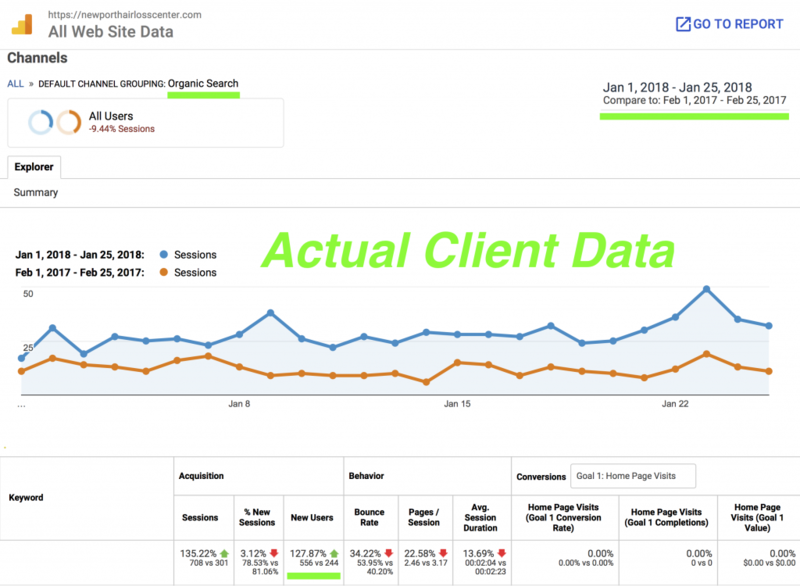 Within just two months, her site’s ranking on Google improved significantly. On January 17th, her visibility percent reached 77.74% – a whooping 33% improvement. Also, we helped her rank #1 on Google for 9 more keywords including important ones such as: Cancer Hair Loss Los Angeles. We also improved results not only for her Los Angeles and Newport Beach locations but also for her San Diego location, which had very little presence before the campaign started. Keywords such as Chemotherapy Hair Loss San Diego are now ranking on the first page. 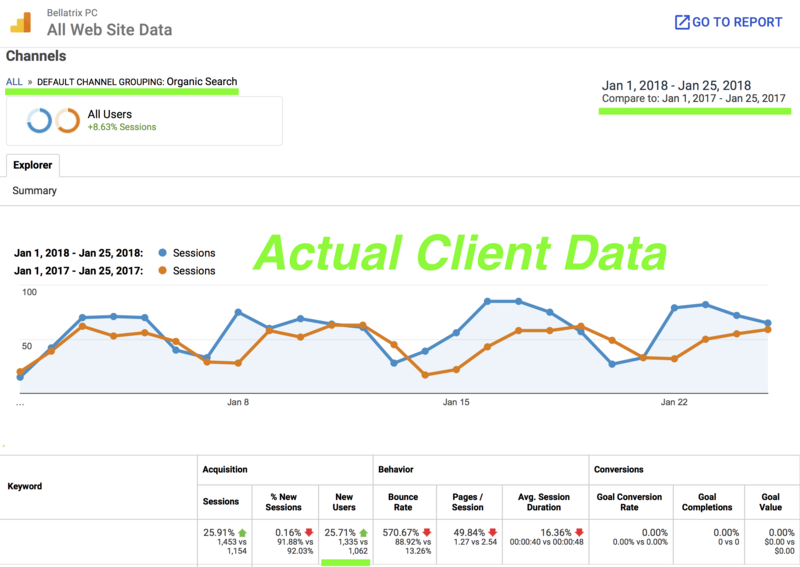 Her site’s unique visitors from Google organic search has improved by 127.87% in January of 2018 compared to the same time-frame in February 2017. All of these improvements has had a great effect on the number of calls they are receiving from Google organic visitors. 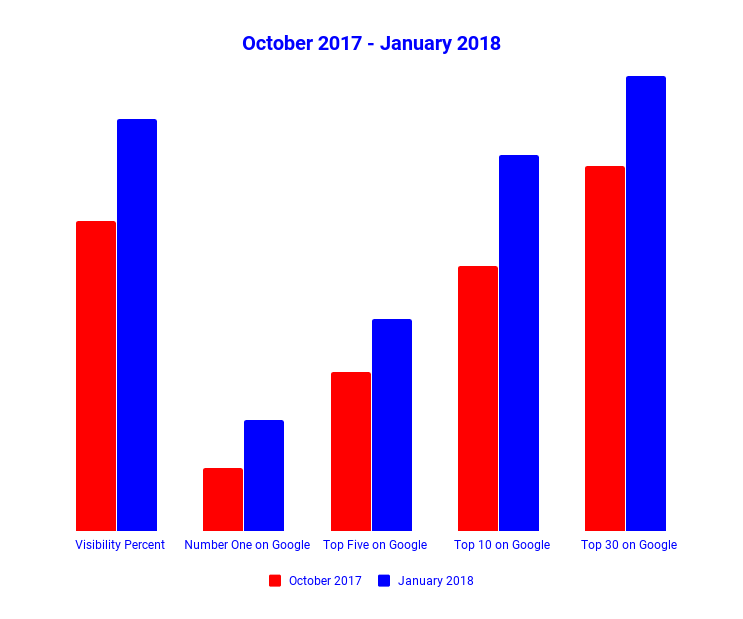 In the first three weeks of January, they received 17% more calls from customers who found them on Google organic search compared to the same time-frame in November. “We’ve only worked with Ali and his team for just over two months. Excited to see how much more they can improve our results,” says Nazy Curtis for Newport Hair Loss Center.